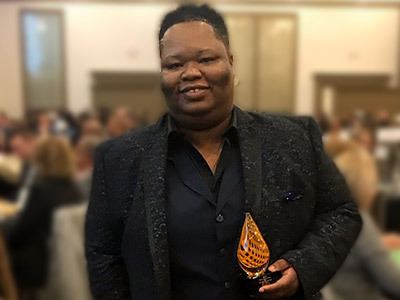 Recently nominated by current Pittsburgh Seminary student and Metro-Urban Institute Fellow Sonya-Marie Morley for the YWCA Greater Pittsburgh’s Racial Justice Award, the Rev. Shanea Leonard ’05 was selected as the 2018 Awardee in Faith. Shanea is the founding pastor of Judah Fellowship Christian Church in Pittsburgh and recently accepted a new position as associate for racial and gender justice with the PCUSA’s Presbyterian Mission Agency. “Rev. Leonard and I go way back to our participation in the Alum Chapter of the historically black Sigma Gamma Rho Sorority Inc., which she joined while a student at PTS,” notes Sonya-Marie. Just like Jesus Christ, the God she serves, Pastor Shanea D. Leonard, continues to answer her call to ministry by standing in solidarity with the oppressed, marginalized, disenfranchised, least, last, and lost in our broken and hurting world (Matt 25:40-45). She takes seriously the mission that Christ articulated in Luke 4:18-19. “Perhaps the most faithful witness of the inestimable work Pastor Leonard has done toward those ends is Judah Fellowship Christian Church, a PC(USA) church that Pastor Leonard planted to minister to the needs of those whose past, destructive, and damaging relationships with the Church (writ large) has left them estranged from God. Through the life-giving, radically affirming work of Judah Fellowship, the only predominantly black inclusive church in Western Pennsylvania, Pastor Leonard attends to the unique spiritual needs of the LGBTQIA+, HIV positive, and homeless populations, while simultaneously ministering to the needs of the ‘typical’ worshiper who is seeking to live abundantly into relationship with God in a loving, nurturing faith community. “Pastor Leonard’s approach to injustice is driven by the responsibility of reconciliation, which 2 Cor 5:18-19 reminds us is a biblical imperative. Her work includes high level planning, partnering, and administrative work, such as serving as a member on the Board of Directors of the Pennsylvania ACLU; serving on a committee with the U.S. Attorney’s Office to evaluate racism and issues of intersectionality at the Allegheny County Jail and Shuman Center; serving as the former chairperson on the Board of Directors of New Voices; and serving on the Affordable Fair Housing Task Force to address racial inequities in Pittsburgh housing. Her work also includes organizing grassroots justice movements . . . [drawing as many as 1,500 attendees]. Her broad-based civil rights and advocacy work encompasses social, racial, and economic justice work . . . . In addition, she has partnered with countless LGBTQIA+ organizations to organize trainings on racism and intersectionality, and she continues to serve as a community organizer for New Voices. In ministering to all as God’s beloved children, Shanea faithfully responds to God’s call on her life.